Our understanding of past climates (paleoclimate) and 5-6 C long term climate sensitivity. And if you’re a frequent returner, you’ve probably figured out by now that the two go hand in glove. Looking back to a period of time called the Pliocene climate epoch of 2.6 to 5.3 million years ago, we find that atmospheric carbon dioxide levels were somewhat lower than they are at present — ranging from 390 to 400 parts per million. We also find that global temperatures were between 2 to 3 degrees Celsius warmer than 1880s ranges, that glaciers in Antarctica and Greenland were significantly reduced, and that sea levels were about 25 meters (82 feet) higher than they are today. Given that atmospheric CO2 levels during 2017 will average around 407 parts per million, given that these levels are above those when sea levels were considerably higher than today, and given that these levels of heat trapping gasses are rapidly rising due to continued fossil fuel burning, both the present level of greenhouse gasses in the Earth’s atmosphere and our understanding of past climates should give us substantial cause for concern. This past week, even more fuel was thrown onto the fire as a paleoclimate-based model study led by Nick Golledge has found that under 400 parts per million CO2 heat forcing during the Pliocene, substantial portions of Antarctica melted over a rather brief period of decades and centuries. Notably, the model found that the West Antarctic Ice Sheet collapsed in just 100-300 years under the steady 400 ppm CO2 forcing at 4.23 million years ago. In addition, the Wilkes Basin section of Antarctica collapsed within 1-2 thousand years under a similar heat forcing. In total, the study found that Antarctica contributed to 8.6 meters of sea level rise at the time due to the loss of these large formations of land ice. We conclude that the Antarctic ice sheet contributed 8.6 ± 2.8 m to global sea level at this time, under an atmospheric CO2concentration identical to present (400 ppm). Warmer-than-present ocean temperatures led to the collapse of West Antarctica over centuries, whereas higher air temperatures initiated surface melting in parts of East Antarctica that over one to two millennia led to lowering of the ice-sheet surface, flotation of grounded margins in some areas, and retreat of the ice sheet into the Wilkes Subglacial Basin. The results show that regional variations in climate, ice-sheet geometry, and topography produce long-term sea-level contributions that are non-linear with respect to the applied forcings, and which under certain conditions exhibit threshold behaviour associated with behavioural tipping points (emphasis added). This study began the publication process in 2016 when year-end atmospheric CO2 averages hit around 405 parts per million. By end 2017, those averages will be in the range of 407 parts per million. Even more worrying is the fact that CO2 equivalent forcing from all the various greenhouse gasses that fossil fuel burning and related industrial activity has pumped into the atmosphere (methane, nitrogen oxides, CFCs and others) will, by end 2017 hit around 492 ppm. As a result, though conditions in Antarctica are presently cooler than during 4.23 million years ago, the considerably higher atmospheric greenhouse gas loading implies that there’s quite a lot more warming in store for both Antarctica and the rest of the world. A warming that, even if atmospheric greenhouse gasses remain at present highly elevated levels and do not continue to rise, could bring about a substantially more significant and rapid melt than during the Pliocene. The Pliocene. A period of time 2-5 million years ago hosting carbon dioxide levels ranging from 350 to 405 parts per million and global average temperatures that were 2-3 degrees Celsius hotter than 1880s levels. The great ice sheets of Greenland and West Antarctica were feeble, if they existed at all. And seas were about 25-80 feet higher than today. In the context of human warming, the amount of heat forcing we’ve added to the global atmosphere from carbon dioxide emissions alone has been hovering in the range of the Pliocene for the past two decades. A heat forcing that, if it remained steady over a substantial period of time, would almost certainly revert the world to a climate state last seen during that time. The Middle Miocene Climate Optimum occurred between about 15 and 17 million years ago. It hosted an atmosphere in which carbon dioxide levels varied wildly from 300 parts per million to 500 parts per million. Temperatures were between 3 to 5 degrees Celsius hotter than the 19th Century. And sea levels were about 120 to 190 feet higher. During this period, the world was still cooling down from the heat of the Paleocene and Eocene epocs. Carbon was being sequestered. 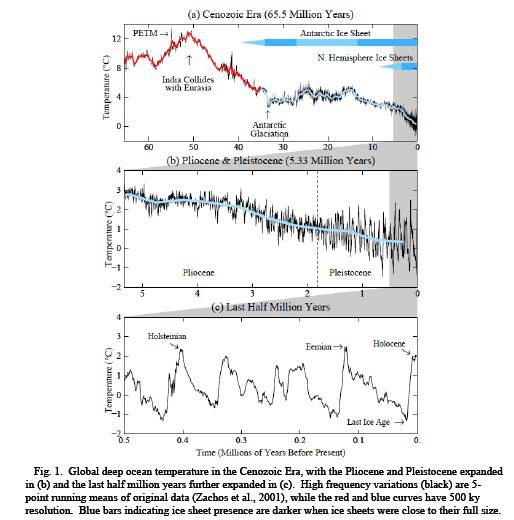 And it was the first time the world broke significantly below a 500 part per million CO2 plateau that had been established during the Oligocene 24 to 33 million years ago. The great glaciers in East Antarctica were mostly well established, even though their scope was a mere shadow of what we see today. 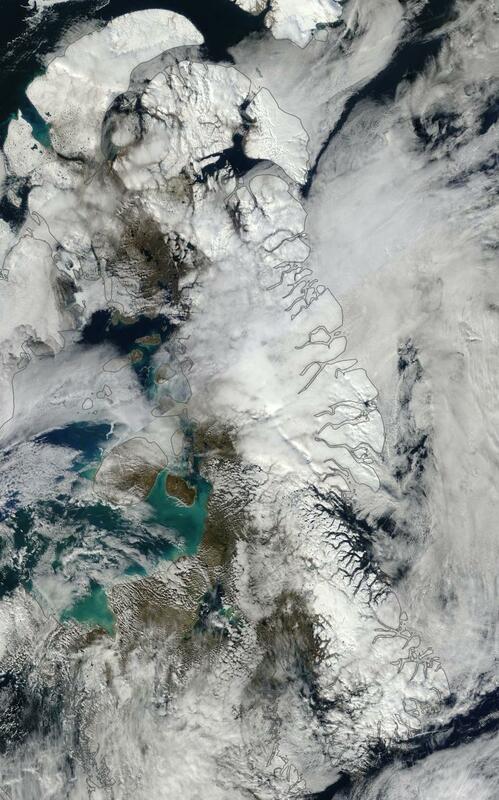 The Greenland and West Antarctic glaciers did not exist. They would have to wait for about another 5-10 million years for the Earth to cool further. 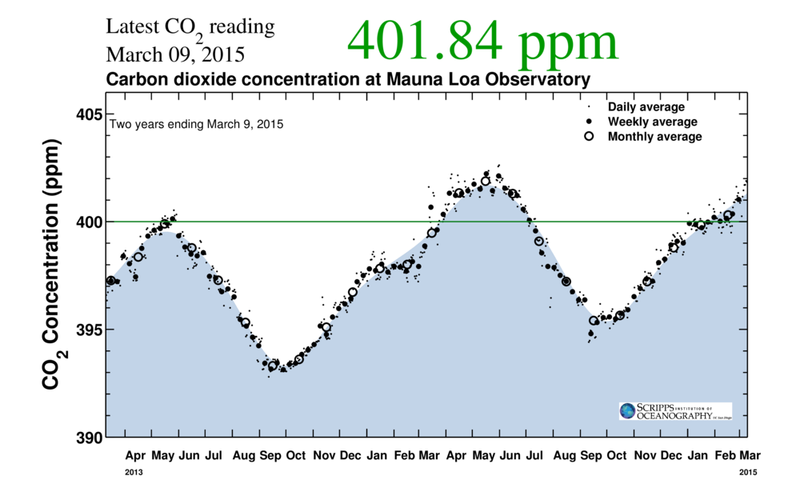 As of March 9, 2015, atmospheric CO2 levels had reached 401.84 parts per million. Already a level testing the Pliocene-Miocene boundary, this measure will continue to increase through the rest of March, on into April, and keep rising until middle or late May. 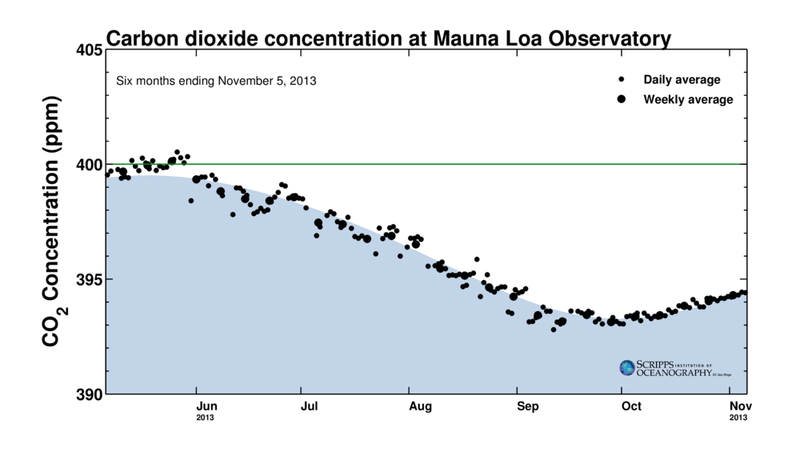 At that point, global CO2 levels will have reached around 404 parts per million. At least the highest levels seen in the last 3 million years and possibly the highest levels seen in 15 to 18 million years. If the greater portion of this range is correct, then we are now breathing air that none among our species or even our hominid relatives have ever breathed since their setting foot on this world. But CO2 alone doesn’t tell the whole story. Equivalent CO2 levels (CO2e) including all human emitted greenhouse gasses — methane and a host of industrial gasses — will reach about 484 ppm CO2e this year (see here and here). And that forcing puts us easily within the range of the warmest periods of the Miocene. A brew of heat trapping gasses including exotic chemicals that no creature has likely ever breathed while living on the Earth.